When jaded gun-for-hire, Simeon Pope, takes what he thinks will be a routine job he finds himself working for both sides of a divided family. Confronted by a bad man, a mad man and a law man, Pope struggles to satisfy all his clients, impress the woman he desires, and stay just on the right side of the law. 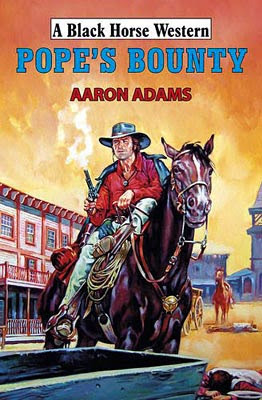 This is the first Black Horse Western to carry the author name of Aaron Adams and is also the first that I can remember to feature a male character that enjoys the company of both men and women. And it’s him, Haze Willerby that both his father and brother want Pope to find for very different reasons. Once Pope tracks down Willerby it seems he’ll be able to satisfy both his employers but Adams has some surprises waiting that dash Pope’s hopes and they result in both Pope and Haze being hunted for murder. Aaron Adams’ book begins at a canter and soon charges ahead at a gallop and never lets up in pace thereafter. The story is filled with twists and turns making it impossible to predict just where the tale will go next. There are some strong adult themes throughout and most of the characters are unlikeable but all are fascinating and you will want to discover what happens to each and every one of them. There was one thing that I wasn’t sure about though, and that was how easily tough grown men burst into tears (three of them at different times), hardened men all who I’d have thought would have been able to control their emotions a little better. Still this maybe just how I prefer the men in westerns to act. Overall I found this to be an easy read that proved to be very entertaining. The Lost Treasure Ship of the Mojave, said to be loaded with a cargo of black pearls from the sea of Cortez, was probably the oldest, most persistent tale of lost treasure in the West. Ned Gamble, a down-at-heel drifter, is hired to guide a high-class Mexican woman into the Yuha Badlands in search of the ancient vessel and finds instead that he’s stumbled into a game of treachery and triple-cross. Still, unravelling the legend of the ancient ship would make a man rich as a king…if it doesn’t kill him first. Based around the mythical lost ship of the Mojave which legends say is a Spanish ship laden with pearls, lost in the 1600s and all but forgotten until sometime in the 1800s when some set out to find it. Josh Lockwood’s third Black Horse Western tells of a fictional search for the missing ship that proved to be a gripping read as I wanted to know if Gamble would find the ship and if he did, would it’s treasures (if they existed) bring wealth and happiness. Of course the title of the book hints that everything will not run smoothly and that danger through triple-cross will have to be overcome, but who was going to cross who? The story involves Indians, Mexican bandits, and a beautiful arrogant woman who Gamble really can’t bring himself to like in anyway. Lockwood’s descriptions of the desert landscape are particularly well written and the action scenes are fast and hard-hitting. Gamble is a likeable hero and I found myself sharing his dislike of the woman who hired him and of his loathing of bacon and beans (you’ll have to read the book to find out why this is). After the triple-cross the tale becomes a classic vengeance tale that ends in a brutal gunfight that provides an exciting end to the story. When a small band of settlers seems to vanish into thin air from their camp in the Black Hills, the army asks Skye Fargo to find out what happened. Unfortunately, he’s also saddled with a young greenhorn officer with too much starch and not enough experience. 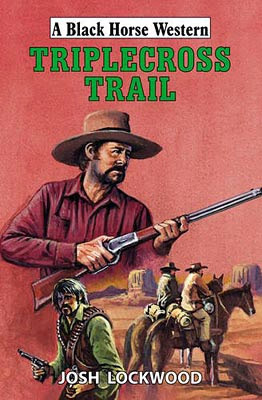 But the tenderfoot is about to learn from the best – while the Trailsman is about to go up against something much worse…. This makes four in a row that sees David Robbins writing behind the pseudonym of Jon Sharpe and this book offers all fans of his work everything he’s known for. Great characterization, superbly witty dialogue that is laced with humour and sarcasm, and hard-hitting action scenes, of which there are many. 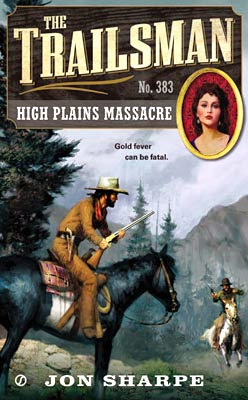 David Robbins also brings back Bear River Tom, who last rode alongside Skye Fargo in book #374: Fort Death. Tom is a fellow scout who has a fascination with something that makes him a very difficult character to forget and it’s his comments that lead to a lot of the laughter inducing exchanges that add some lighter moments to this savage tale. The first part of the story has plenty of mystery that easily hooks and drags the reader into the plot, mainly based around how a whole group of settlers can vanish without a trace. This leads to a run in with a vicious group of outlaws whose leader has some strange demands of the Trailsman when Fargo is held prisoner. The massacre of the title proves to be a gut-wrenching slaughter that will have every reader urging Fargo on to deal his own brand of justice to those responsible. If you like this series and/or David Robbins’ storytelling then make sure you don’t miss this one. Something a little different to the books I usually comment on but one I thought would be of interest to some of you who read Western Fiction Review as I know many writers, both beginners and old-hands, view this blog regularly. Even though I don’t have any ambitions to write a western, or any other book for that matter, I still thought I’d find this an interesting read and this proved to be true. Nik Morton, who writes westerns under the pseudonym of Ross Morton and is the editor in chief for Solstice Publishing, includes examples to back up the many points he makes on such topics as preparation, point of view, plot-plans, dialogue, self-editing, formatting the manuscript, and marketing, to name but a few. Nik Morton’s writing is straight-forward and doesn’t come over as too technical, making me believe I would be confident in writing a western by following his plan if I so desired. 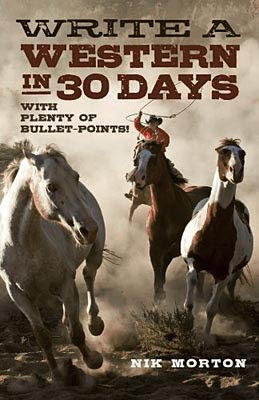 Even if you are already an author with ideas of your own on how to write westerns, I still think you’d find plenty of tips within this book. The reference sections, that list books, websites, agents, and western publishers, should be worth the price of this book alone. Available as both a paperback and ebook. And finally a little note of thanks to Nik for mentioning Western Fiction Review three times within his book. If the law didn’t get you, a bounty hunter would, when you were wanted: dead or alive. Carpetbaggers stole his land, and a jury had called self-defense murder. As he saw it, Wilson Young was left with precious few options. 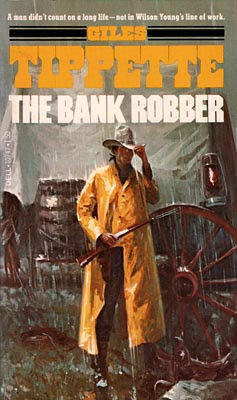 So he broke out of jail, strapped on his gun, and made a living the only way he could – by robbing banks and growing into a Texas-sized legend. Wilson Young makes for a very strong central character, he’s tough yet can make simple mistakes that put him and his two companions (childhood friends) into deadly danger. Tippette’s storytelling is captivating, gritty and well plotted. His dialogue is believable and the action scenes, and their aftermath, are hard-hitting. The darker side of the story is often balanced with moments of humour. The story is told in the first person, through Wilson Young. This is the first book by Giles Tippette I’ve read and it certainly won’t be the last, in fact this became the first of a nine book series. It was also filmed as The Spikes Gang. 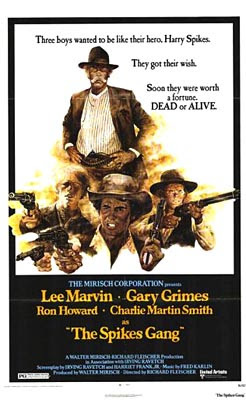 The Spikes Gang was directed by Richard Fleischer and starred Lee Marvin as Harry Spikes, Gary Grimes as Wilson Young, Ron Howard as Les, and Charles Martin Smith as Tod. It’s been a long time since I’ve seen this film (it can be viewed in its entirety on YouTube). Parts of it are taken from the book, including the character Kid White (played by Arthur Hunnicutt), but the main difference is that Lee Marvin’s character doesn’t exist in the book! As is nearly always the case for me regarding books made into films, I found the book to be the most enjoyable of the two, but both are very entertaining. Sharper Wade rides into Virginia City more by chance than intent. He’d heard about the Comstock Lode and the vast wealth in gold and silver that was being mined there, but Sharper’s needs are limited to having enough money to eat, feed his horse and buy ammunition. He is in town no more than an hour when he witnesses a brutal attack on a defenceless girl and her grandfather by three cowboys and steps in to help, landing himself in jail accused of murder. But he had a witness who can exonerate him and Sharper needs to find the men responsible, or lose his life…. 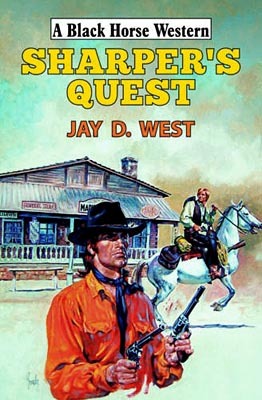 There are five previous Sharper Wade books but fans may well have given up reading a new story about him long ago as the last book, Hell Riders, came out in 2001. I haven’t read the whole series but did find those I have to be very entertaining, so I for one was pleased to see this book announced. Events in Hell Riders do get a brief mention but you don’t have to have read that book (or any of the others) to enjoy this one. Jay D. West writes at a fast pace, switches from character to character to show how changes to situations effect those people and their plans. The plot throws up a couple of neat twists and turns too. There’s plenty of action that is often described quite graphically. On finishing this book I can only hope that Jay D. West doesn’t make us wait anywhere near as long before for Sharper Wade to hit the trail again. Holt County, Nebraska, 1882. On the edge of unorganized territory with moneyed cattlemen and killer horse thieves, anything goes and everyone is suspect. After Sheriff Bernard Kearns is killed in a gunfight Whit Branham failed to prevent, the deputy considers leaving O'Neill. But bad doings in the rough country of the Niobrara River offer him an opportunity for reasoned justice...or cold, hard revenge. Whit Branham makes for an engaging hero, a man who has many good qualities yet lets the desire for revenge rule his actions at times. His need to hunt and take down the killer of Sheriff Kearns being the major thread of this story. This is expertly blended in with a tale of horse theft that adds to the intrigue of this fast moving tale. Richard Prosch includes just enough descriptive scenes to create a vivid backdrop through which his knowledge of the area shines. 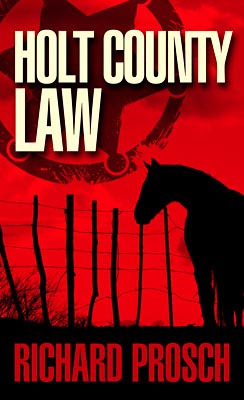 Holt County Law is a tough tale filled with some great characters and everything builds well to its satisfying conclusion that closes with a neat hook that should ensure everyone who reads this book will be eagerly looking forward to the next in the Whit Branham series.